A joyous, memorable Christmas surrounded by the people she loves. That’s what Gina Jones wanted when she contacted the Dream Foundation in November, 2015. Weeks later, a knock on the door brought Gina and her grandchildren presents, decorations, and food galore, not to mention a merry band of elves. While the Dream Foundation has made over 23,000 dreams come true, and never turned down a qualified request, their swift response was still a shock to Gina. “My initial call to Gina was emotional,” recalls Katarina Robledo, the dream coordinator who managed Gina’s case. “She was absolutely overjoyed with us wanting to grant a dream for her, she couldn’t believe that her application had been accepted. Gina, 50, suffers from chronic obstructive pulmonary disease, or COPD, a condition which affects over 24 million people in the United States alone. It is the third leading cause of death in the United States, and women are disproportionately affected. Most cases are caused by smoking, but genetics, air pollution, and infections can also play a role in causing COPD. Gina was diagnosed in 2014 and is currently at stage 4, the most severe grade for COPD. Most people with stage 4 COPD suffer with extreme shortness of breath and are often unable to even leave the house. 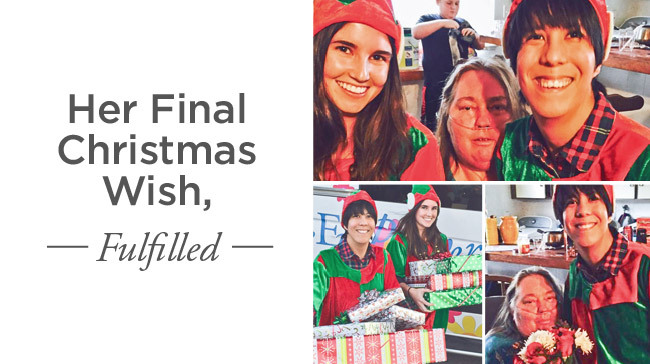 For what will likely be her last Christmas, Gina wanted to give her grandchildren — Christina and Matthew, both of whom she adopted — a truly memorable day, filled with presents and holiday cheer. She also needed some help paying off some expenses, including loans, household bills, and a Rent-A-Center bill.